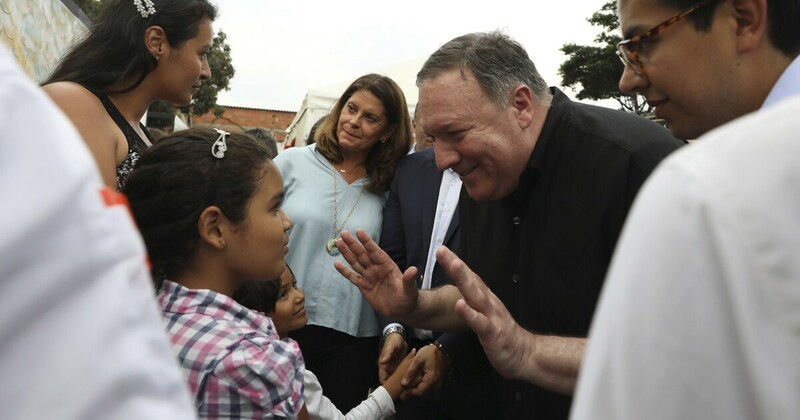 Secretary of State Mike Pompeo visited Colombia's border with Venezuela on Sunday where he talked up U.S. support for refugees, repeated demands that illegitimate Venezuelan president Nicolás Maduro step down, and threatened a host of new sanctions for good measure. But despite those individual statements, Pompeo's visit lacked a coherent plan. This is, in part, a problem of Washington's making. By declaring support for opposition leader Juan Guaidó, the Trump administration put all of its diplomacy cards on the table. That bold move might have worked, had Guaidó been able to rally the support of the military. But he could not. The Venezuelan military was not quite ready to jump ship when Washington declared support for Guaidó, nor when the U.S. attempted to force aid into the country to foment popular opposition to Maduro. Instead, a U.S.-backed attempt to overcome borders with aid fizzled, leaving not a triumphant march on Caracas as envisioned but a stalemate. Now, the U.S. is in a bit of a pinch. It wants to end the crisis, but it can not negotiate with Maduro after declaring his leadership illegitimate. Added to the mess are increasingly troubling ties between Moscow and Caracas that saw Russian troops landing in Venezuela earlier this spring. Far from simply upending the government of one country, Washington is now engaged in a diplomatic dance for influence in Latin America with familiar agitators Russia and Cuba. Politically cornered and with few options left aside from military intervention, the Trump administration has settled for hoping that the slow squeeze of sanctions will do the trick and finally push Maduro from power. Perhaps I'm a cynic, but if Maduro has not given up control yet even as his people starve and are in desperate need of medicine, further economic pain is unlikely to be the magic bullet that Pompeo and Trump seem to think it is. That leaves the U.S. without a real plan.